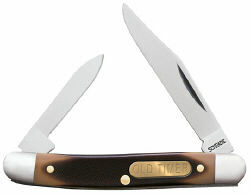 Old Timer Knives are genuine classics made today by Taylor LLC. Featuring saw-cut durable Delrin handles, brass liners, nickel silver bolsters, and stainless steel blades these are the knives that you remember from bygone times. This Old Timer Minuteman features a 2-blade design. I had an old timer that I'd owned since I was a kid, it was misplaced and this is the knife that I purchased to replace it. It is so similar to my original that all I have to do know is break it in to have my old knife back.